Great loss of human life, structural damage, and social and economic upheaval occur repeatedly due to such natural hazards as earthquakes, typhoons, hurricanes, landslides, floods and tsunamis. Both the US and Taiwan, along with many other countries, have a history of such occurrences and a common need to reduce their effects. This volume includes papers from the fourth symposium workshop, held jointly between the US and Taiwan to discuss research and its application to multiple hazard mitigation. The workshop, Urban Disaster Mitigation, The Role of Engineering and Technology, discussed lessons learned from recent natural disasters; assessed results of Taiwan's multiple hazards research program and potential application to the US; and proposed further studies on subjects of mutual concern. Topics include recent scientific findings obtained in various natural hazard areas and assessment of actual and potential damage from earthquakes, floods and landslides. Of particular importance are measures that can be taken to mitigate these hazards ranging from use of new algorithms for structural engineering to warning systems for a given region. At a time when natural disasters are widespread, engineers play a key role. Construction methods and building codes are changing; current knowledge shapes the direction of these changes. The research results presented in these proceedings will benefit both the academic and practicing communities around the world, strengthening the relationship between these two important parties. For professors, graduate students and practising engineers in the fields of structural, hydraulic and earthquake engineering; seismology and soil and rock foundation engineering. Also governmental policy makers, building - code developers, architects and city planners. Preface. Symposium/Workshop Activities. Resolutions. Seismology. Characteristic earthquakes and long-term earthquake forecasts: implications of Central California seismicity (W.L. Ellsworth). Comparison of observed ground acceleration response spectra from four recent large earthquakes in California with uniform building seismic design spectra (Y.B. Tsai). Uncertainty analysis in seismic hazard evaluation (C.H. Loh, Y.T. Yeh). Taiwan Strong Motion Instrumentation Program (TSMIP) and preliminary analysis of site effects in Taipei basin from strong motion data (K.W. Kuo et al.). Earthquake Engineering. Systematic determination of seismic safety levels for design of R/C buildings (A.H.-S. Ang, D. de Leon). Inelastic behavior and load displacement equations of low-rise RC solid and perforated shear walls (F.Y. Cheng, K.Y. Lou). Research on infilled hollow clay tile walls (J.E. Beavers et al.). Vulnerability study of school buildings in Taiwan before and after retrofitting (M.S. Sheu, C.C. Hsu). 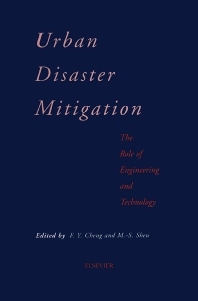 Systems integrated approach in natural hazard mitigation (G.C. Lee, A.S. Dargush). Absolute acceleration feedback control of structures (L.L. Chung et al.). Bridge damage diagnosis by vibrational signature analysis (G.C. Yao, K.C. Chang). Seismic performance of bridges in California during the Jan. 17, 1994 Northridge earthquake (L.H. Sheng). Steel connection failures during the Northridge earthquake (W.F. Chen). Analysis of building seismic records using artificial neural networks (W.R. Chang, S.T. Mau). Landslides and Rockslides. Seismic stability of cohesive soil slopes (T.D. Stark et al.). A correlation between landslide and rainfall data along A-Li San highway of Taiwan (S.T. Chen et al.). Reducing landslide risk in urban areas — Experience in the United States (R.L. Schuster). Mechanism of initiation of debris flow (R.H. Chen et al.). Flood Engineering. Urban flood hazard and its mitigation (B.C. Yen). Inundation models for Pa-chang creek basin in Taiwan (M.H. Hsu et al.). Flood mitigation through joint flood control operation of parallel reservoirs (F.N.-F. Chou, D.Y. Chen). Rainfall estimates from satellite observations (M.L.C. Wu). Socio-Economic Impact. Social science approaches in disaster research: selected research issues and findings on mitigating natural hazards in the urban environment (J.M. Nigg). Economic aspects of urban vulnerability and disaster mitigation (B.G. Jones, S.E. Chang). Index of Contributors. Keyword Index.